This Residence , D'Majestic Place offers 688 sq ft of spacious living. Tastefully designed which includes a spacious bedroom with Kingsize bed ,living hall with work area , dining area and kitchenette includes cooking facilities, fridge and in-room washer and dryer amenities. The facilities are reflective of its ultra luxe indulgence, with a rooftop terrace boasting of a Hi-Fit gym, infinity pool, sauna and Hi-deck patio. The spacious bedroom room is designed with accents of vivid colour and subtle palettes to replicate a sanctuary for the urban travellers. Canvas clad modern art adorn the walls infusing modern aesthetic with homely comfort. In terms of accessibility, Pudu is very centrally located for the usage of public transport. * 200m to Star Pudu LRT. * one bus stop right in front of the D'Majestic doorstep. * In terms of driving, the Smart Motorway Tunnel is right down the street. * within walking distance- Tung Shin Hospital. * 800m radius - Pudu Police Station and Kuala Lumpur Police Contingent Headquarters. As reviewed by our guests. 1...Just had a very pleasant stay hosted by Poh at her lovely apartment in D'Majestic Place Hotel and Residences. Would recommend the apartment for a spacious holiday rental for a couple. The apartment is quite new, very clean and exactly as pictured. It is stylish and spacious in design. Nice bathroom design which seperates the rain shower and toilet into two private glass cubicles with the vanity basin in between which makes it very functional. Basic utensils and crockery provided for light cooking along with microwave, toaster and kettle. Washer Dryer combo is a huge bonus. Full aircon and ceiling fans throughout. The bed is kingsize however it is very firm. Although a hotel there is no bar or restaurant available onsite however lots of options in immediate vacinity. Pudu area is an old established area and attracts lots of locals for its huge variety of local cuisines. Short walk to LRT station over the bridge adjacent to the hotel for access to other parts of town. Easy walking to Times Square Mall, and from there the vast selection of shopping in KL's Golden Triangle. Undoubtedly the highlight of the property is the stunning rooftop infinity pool and associated facilities. Affords stunning views of KLCC particularly at night. Property manned by security guards 24/7. We would reccommend. 2....Poh Chooi's apartment was exactly like it looks like in the pictures! She was very nice and welcoming, she stressed to contact her if there was anything we needed, but we had no problems what so ever so we had no reason to contact her. The apartment was clean, spacy and the views are gorgeous. Good location with Pudu LRT stop only a few minutes away and Bukit Bintang district about 10 minutes walk away. Oh and that rooftop infinity pool is just amazing with a great view of the KL skyline. 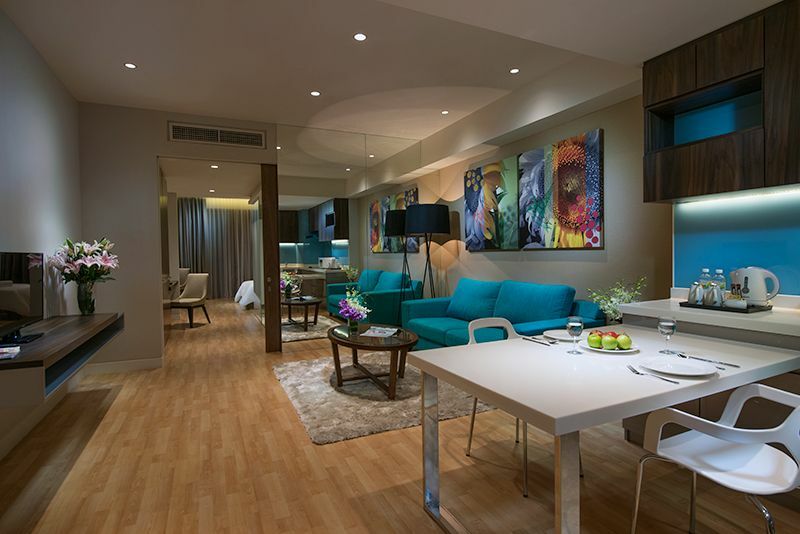 3...This apartment is one of many residences in D'Majestic Hotel. We stayed 11 days It was very nice there , the kitchen was minimalistic but had everything we needed. The View from the bedroom is amazing and there is much space in this apartment. The highlight was the Gym and Roof Top in the 20th floor. It never was that full so we could enjoy work out and swimming when we wanted. The staff is very nice and welcoming. Train station is 5 min walking, taxi is always available.Poh Chooi was very undifficult waited at the lobby at midnight for us and explained us everything. Would really recommend. 4...My girlfriend & I stayed at the apt. for 4 days. The place was immaculate and Poh Chooi was very helpful and greeted us in the lobby when we arrived. There is a really nice view from the room and the top floor with the pool etc. is really nice. The place is within walking distance to Low Yat Plaza and Berjaya Times Square. There are plenty of local places to eat nearby and the door man was always helpful getting us taxis. Would definitely stay again. Very clean and modern apartment. Hostess goes out of her way to make you feel welcome and provides an extensive review of nearby highlights, transportation etc. Lovely infinity pool on the roof. Unfortunately, during our stay we lost electric power for about 8 hours and internet for over 24 hours(not our hosts fault). Although there are shopping plazas nearby, they are extremely difficult to access by foot, as Kuala Lumpur is not a pedestrian friendly city. Fortunately, Uber and Grab Car are very easy to obtain and quite inexpensive. Poh Chooi is both efficient and kind. She has welcomed us in the lobby of the D-Majestic residence. Poh Chooi is both efficient and kind. She has welcomed us in the lobby of the D-Majestic residence. The flat is very well kept and elegant. The bathroom is spacious, equipped with a modern and powerful shower. The king size bed is wonderful. Everything exactly matches the description posted on the site. The roof-top (big) swimming is a real plus, with its view on KL skyline. The neighborhood is genuine (not touristic), lively, with a lot of shops. It takes 5 minutes to get to Pudu tube station and about half-an-hour to get to KLCC. In a nutshell, Poh Chooi's flat is a must, at a very convenient price. We ADORED our home in KL (2 adults + 2 year old son). The apartment is brand new and even bigger and better than the photos suggest. You can see the Petronas Towers from the bedroom. The wifi connection worked very well. Our host, Poh Chooi, was very kind & welcoming & went out of her way to help us in every way. All the staff we met at the hotel were also very nice. A few minutes walk from the accommodation there is a big supermarket and there are some eating options although we mostly chose to cook or eat at Jalan Alor (which was a 20 minute walk away). Pudu LRT is only 5 minutes walk from D'Majestic which was practical for all our journeys and is also on the line direct to/from TBS - the long distance bus terminal. Last but certainly not least, the infinity pool was an absolute highlight and we used it every day. Thank you for a fantastic stay - highly recommended! Merci .Nous avons passé un agréable séjour à KUALA LUMPUR. May nous attendez à la résidence et nous a très bien acceuilli. La salle de sport et la piscine sur la terrasse sont Superbes. Rapport qualité prix excellent. N hésitez pas ,à voir absolument.